In her new book, “Mourning Lincoln,” Martha Hodes, a history professor at New York University, has carefully woven a record of the innermost thoughts of common people around the country and how they reacted to the news of Lincoln's death. On April 15, 1865, President Abraham Lincoln died after being shot the evening before by John Wilkes Booth at Ford’s Theatre in Washington, D.C. The attack came five days after Confederate Gen. Robert E. Lee surrendered at Appomattox, Va., effectively ending the Civil War. You’ll find these facts in just about every American history book. What has remained largely undocumented, though, is the fallout: how a nation deeply splintered by war and slavery reacted to the news of Lincoln’s assassination. In her new book, “Mourning Lincoln,” Martha Hodes, a history professor at New York University, has carefully woven a record of the innermost thoughts of common people around the country. In advance of a lecture at Radcliffe Institute for Advanced Study on Monday, the Gazette spoke with Hodes about Lincoln’s legacy, as seen through the eyes of his supporters and critics alike, in the days following his assassination. GAZETTE: What sort of personal accounts did you collect for “Mourning Lincoln”? HODES: To research “Mourning Lincoln,” I read hundreds and hundreds of diaries, letters, and other personal writings, including Union and Confederate, black and white, soldiers and civilians, men and women, even children. GAZETTE: You have an upcoming lecture at the Radcliffe Institute of Advanced Study. Did you find anything of interest in the Schlesinger Library there? HODES: I found many wonderful archival collections at the Schlesinger Library, most important among them the Browne Family Papers. Two of the protagonists in the story I tell are husband and wife Sarah and Albert Browne, white abolitionists from Salem, Massachusetts. Albert was down South working for the Union Army, so he and Sarah wrote each other long letters, and Sarah also kept a diary at home in Salem. Apart from the Brownes, one of my favorite documents from the Schlesinger is the account book of an anonymous seamstress, which includes mention of Lincoln’s assassination squeezed into the woman’s financial records. GAZETTE: Today, Lincoln’s assassination is almost universally lamented. Was this the case at the time of his death? HODES: Not at all, no. I found it fascinating that Lincoln’s mourners wrote in their diaries and letters that the whole world was mourning for Lincoln when they could see all around them that that wasn’t true. For one thing, they knew that the vanquished Confederates were not mourning Lincoln, and many also knew that not all white Northerners were mourning. Lincoln’s northern enemies, members of the northern Democratic Party and their families, were just as gleeful as Confederates. GAZETTE: Did African-Americans have as complex a reaction as the rest of the nation? HODES: African-American leaders had criticized Lincoln during the war, pressing for more decisive action on emancipation. By the end of the war, though, they could look to the Emancipation Proclamation and to Lincoln’s Second Inaugural Address, which had reckoned directly with slavery as a cause of the war. African-Americans, both North and South, genuinely grieved over Lincoln’s assassination. GAZETTE: This being the first assassination of a sitting U.S. president, how did the White House respond? Did it accommodate mourners looking to pay final respects? HODES: Very much so. There was an elaborate funeral in Washington on April 19, just four days after Lincoln died. His body lay in state, with enormous crowds pouring in to view the body. Lincoln’s body was then taken on a two-week, 1,700-mile journey by train from Washington to his hometown of Springfield, Illinois, where he was buried on May 4. Along the way, the body was removed from the train for elaborate ceremonies in 11 cities. GAZETTE: How did people get on with their lives after hearing the news? HODES: One of the things I found most interesting while researching “Mourning Lincoln” is what I call the “persistence of everyday life.” This was partly a matter of necessity — women couldn’t simply ignore domestic labor, for example — but also a form of consolation. For the defeated Confederates, daily tasks were much more trying, since they were in mourning for their entire way of life. GAZETTE: Both the Union victory and Lincoln’s assassination were rationalized as the will of God. How did each side reconcile this contradiction? HODES: All through the war, both sides believed that God was on their side. Union supporters assumed that God had permitted Union victory, and Confederates were confounded that God had permitted them to lose the war. Then, with the assassination, Union supporters were dumbfounded that God had taken Lincoln away at the exact moment of Union victory, while Confederates took it as a sign from God that he really was on their side — even though they still couldn’t figure out why he had let them lose the war. GAZETTE: Did mourners try to justify his death as an act of martyrdom, even with the war coming to a close? HODES: Yes, indeed. Mourners tried to see the assassination as giving greater meaning to the Union victory, even if the larger purposes of divine will remained a mystery. And African-Americans invoked Lincoln the martyr in their quest to press on for equality. GAZETTE: In terms of the near-immediacy with which the public found out, would you call this the first act of real-time, international mourning in history? HODES: You’re right about the near-immediacy. The telegraph spread the word within hours, even as far as San Francisco. But the telegraph didn’t run everywhere, and parts of the U.S. didn’t get the news for weeks. It also took weeks for Europe to get the news, and elsewhere in the world it took months. And yet it felt to mourners as if the whole world was grieving from the moment Lincoln died. That illusion has shaped how we understand the response to Lincoln’s assassination 150 years later. That’s the point of “Mourning Lincoln,” to present a more complicated, more complex portrait of the hours, days, and weeks after Lincoln’s assassination, and to make sense of what that complexity illuminates about the aftermath of the Civil War. 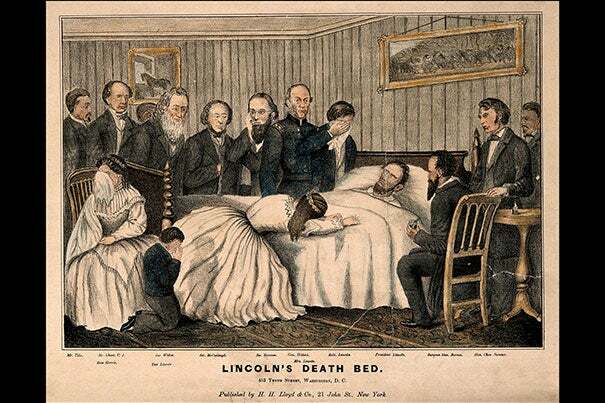 Martha Hodes will speak about “Mourning Lincoln” on Monday (April 27) at 4:15 p.m. in the Sheerr Room at Fay House, Radcliffe Institute for Advanced Study, 10 Garden St., Cambridge. Yukio Lippit (photo 1), Johnson-Kulukundis Family Faculty Director of the Arts for Radcliffe’s Academic Ventures program and professor of history of art and architecture, helped organize the Radcliffe conference “University as Collector.” During the event, scholars will discuss items from Harvard’s collections including Max Beckmann’s 1927 “Self-Portrait in Tuxedo” (photo 2), from the Busch-Reisinger Museum’s collection, and a 1902 inscription (photo 3) from Susan B. Anthony to her fellow suffragist Caroline H. Dall in the just-completed volume four of “The History of Woman Suffrage,” which is part of the Schlesinger Library’s holdings.